If you grew up in the 1980’s and were a fan of NBC’s Knight Rider series, you certainly fantasized once or twice about having your own high-tech talking car to drive around. Well, that fantasy is about to become a reality — kind of. 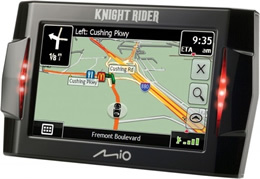 The Mio company has announced they’re producing a special Knight Rider version of their GPS units. You won’t have to worry about getting lost again because KITT will be along for the ride to guide you. When you start up the machine, you’ll hear the sound of KITT’s original voice, William Daniels, say, “Hello Michael, where do you want to go today?” The actor’s recorded all new voiceovers for the device. If you prefer to hear your own name used for the greetings, you can choose one from a list of over 200 prerecorded choices. The display is framed by a group of red LEDs that flash as Daniel’s voice tells you what to do — just like David Hasselhoff’s Trans Am but a little less snotty. The estimated cost for the unit is $270 and comes with maps for the U.S. and Canada. KnightRiderOnline has obtained a sample and you can see how it works in the video below. If Mio puts out a version 2.0 of the device, will it use Val Kilmer’s voice like the upcoming NBC series? Knight Rider: NBC Reduces Episode Order, Essentially Cancelled? Knight Rider: How Did the NBC Movie Do? Are We Getting a New Series?